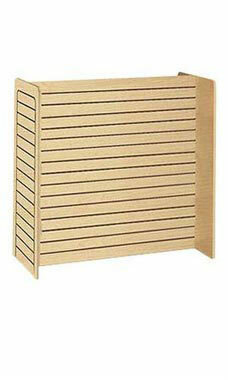 Maple Slatwall Gondola Units attract shoppers with their beautiful wood finish and spacious design. These fashionable maple display merchandisers are attractive without sacrificing shelf space or strength. The unit allows a display to be showcased on all 4 sides for maximum visibility and shelf presence. They make products and displays to stand out instead of being hidden by a distracting display medium. The measurements of this gondola are: 24"W x 48"L x 48"H. These units are in stock and available for immediate shipping!